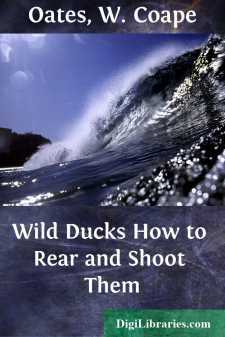 The first point to be decided by the would-be owner of wild-fowl is the locality where he intends to turn down his stock. Wild-fowl can undoubtedly be reared far from any large piece of water, but I am strongly of opinion that birds do better on a good-sized stretch of water with a stream running into it and out of it. Given these advantages, the running water must be constantly bringing a fresh supply of food, especially after a fall of rain sufficiently heavy to cause a rise of water; further, if the stream which runs out of our lake empties itself into a large river, the latter will, when it floods or rises rapidly, cause our stream to back up and bring in a further supply of food from the main river. Some morning the ducks are absent from their accustomed haunts, and if we walk up to the spot where the stream enters the lake, ten to one we shall find our birds there thoroughly enjoying some duck-weed or other food swept down by a rise in the water. This supply of fresh food is a gratifying source of economy to the grain bill at the end of the year, and it is most fascinating to watch the birds "standing on their heads" in their endeavours to reach this change of diet. Another great advantage, too, is that a far higher percentage of fertile eggs will be obtained if the ducks have a large piece of water at their disposal. Given these advantages, it is, however, most necessary for the birds to have some shelter near the lake, both as a protection against the weather and to serve as suitable nesting places. Nothing, for instance, could be better than a stackyard or paddock in the vicinity of the water, and if the paddock is bounded by a flood bank or tall hedge, giving shelter from the prevailing wind, so much the better. Ducks love to nest in stacks, and I have known a pinioned bird work her way up the side of a stack and make her nest fifteen feet from the ground. In stacks birds can burrow so deep that no weather, however inclement, can damage the eggs. Outhouses too are very favourite places for ducks to lay in; also old stick heaps and the bottom of thick hedges. My main point is this, that if you take the trouble to regularly feed your wild ducks morning and evening and keep them quiet, you will soon find that you can get them to lay where you want them to lay, and the places you select will naturally be those where they are secure, or nearly so, from their natural enemies, such as rats, cats, weasels, moles, and other vermin. This is the first secret of success. I have seen wild ducks so tame that within a fortnight from the time they first joined my own birds they were eating maize close to my feet. Having obtained my piece of water and decided on the spot where I mean to feed my birds, the next step is to get the breeding stock. I consider that the best time to purchase the stock is December, as this gives ample time for the birds to pair and get used to their surroundings before the breeding season commences; one is almost sure to get some cold weather in January, and the cold will make the birds more dependent on the food given to them, and therefore more easily managed. Next as to the stock and where to get it. I advise you to obtain your birds from different places, two or three birds from each place, taking care to get fairly young birds, and not older than, say, two years. By this means you will get a certain amount of change of blood, particularly during the second season, when the different broods, which have been well mixed at hatching time, pick their mates and breed.